If you can keep the parade of (white) college coeds straight, then you might find this movie more worth your time than I did. After one student turns up dead, her boyfriend and his roommate go missing, followed shortly by the possible kidnapping of fourth student. Meanwhile, another packs off to Europe without notice and yet another just looks really guilty. That’s not to mention the handful of dormmates and friends who appear as witnesses. Tammy Driscoll’s death from an apparent hit and run prompts a police investigation, but trouble starts before that with an art vandalism and even further back with one father’s bad investments. Aurora Teagarden (Candace Cameron Bure) is drawn into the case when her cousin, Philip (Dylan Sloane), doesn’t show up for his birthday dinner. After she receives a cryptic call from him, she checks in at his dorm room because I guess non-college students drop by all the time at this school. She discovers that Philip’s roommate and Tammy’s emotionally abusive boyfriend, Josh (Dakota Daulby), are missing. What looks like an isolated case turns into something more when the police find $4000 stashed in Philip’s room and Ro learns that her cousin has been lying about visiting a childhood friend, Clayton (Thomas Elms). It took me awhile to distinguish the students, and I never did end up caring about any of them, not even when abandoned vehicles turned up with the students’ blood stains. I also got a little confused when Jason Dell (James Rittinger) appeared, having forgotten that he’s a series regular replacing his brother or cousin Perry. Jason is a young member of the Real Murders Club, Ro’s group of amateur detectives who dig through old and cold cases and increasingly new ones. The trouble is, this movie is lazy with its characterizations, and few of the people in this town have any personality. The Disappearing Game does try to spice things up with a new romantic interest for Ro. Neighbor Nick Miller (Niall Matter) replaces her former partner, Martin, who left several episodes ago to do secret spy stuff in South America. This household, i.e. my mom, is a fan of Matter, and Nick at least isn’t overly protective of Ro. The psychology professor trusts her instincts, so let’s hope he continues to assist her rather than nag her if he lasts longer than one movie. I had initially thought that Nick would be one of the suspects since that’s what guest stars do. There’s enough going on with the students and their families though, with special attention given to Clayton’s wealthy parents, Dan and Carolyn Harrison (Ken Tremblett and Teryl Rothery). They have a reputation in town, and Dan’s business has earned him a few enemies, some of whom could take out their disagreements on Dan’s son. 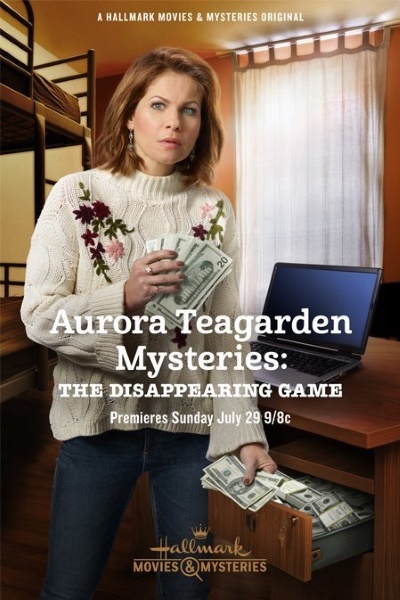 There’s at least two more Aurora Teagarden Mysteries in the works, but I’ve already checked out. As Ro’s best friend, Sally (Lexa Doig), observed, she’s getting a little bossy and self-important. and I don’t know if I have room in my life for a smug librarian, even if she does solve every murder in town. Highlight for spoilers: The Harrisons do what the privileged do – cover up for their misdeeds and excuse them as mistakes when they get caught. Clayton vandalized the sculpture in the opening scene, and when discussing this crime with Philip and Josh, he accidentally hit Tammy with his car. Not knowing what to do, he bundled the two roommates away and asked Mom and Dad for help. Dan Harrison faked his son’s kidnapping and used the supposed ransom money as a cover to fund Clayton’s escape to Europe. Ro eventually finds the two students locked up in the Harrisons’ basement after following up on a clue in the kidnappers’ recycling bin – empty pizza boxes. Posted in USA, Western TV reviews and tagged Hallmark Channel, mystery films, TV movie on October 16, 2018 by limmer13.